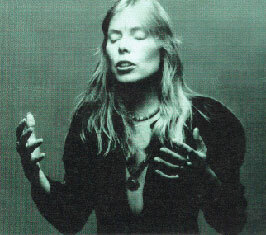 A recording of Joni singing Both Sides Now is used for the Tribute to Canadian Prairies that began with a quote from the novel Who Has Seen The Wind? by the Canadian writer W. O. Mitchell and narrated by actor Donald Sutherland, also of Canada. Thomas Saulgrain (L'École nationale de cirque) performes an interpretive aerial ballet on fly wire. Jean Grand-Maitre, head choreographer for the Vancouver Olympics Opening Ceremony, has been quoted as saying that Joni had a flare-up of Morgellons syndrome that kept her from taking part in Olympic festivities. Really enjoyed it. Joni, you bring the tears.